← The End is Nigh! GABF – How will it die? In an hour we will take a very responsible bus ride to the Denver convention center in order to attend the Thursday session of the 2016 Great American Beer Festival, an event billed as the largest of its kind. But what does that really mean? In the last few years the number of breweries has exploded making it increasingly difficult to attain a slot at GABF. Many well known and recognized breweries like Hill Farmstead, Prairie Artisan Ales, and Crooked Stave don’t seem to feel a need to participate in part because the event is so incredibly huge its hard to really quantify any measurable benefit to serving there. From a consumer standpoint ticket prices are higher and to be honest the quality of beers among many professional breweries these days is severely lacking. This year at the GABF 7,227 beers were judged by 264 judges, of these over 3,800 beers will be available on the GABF floor. When will they admit this is overkill? Several years ago I suggested the Brewers Association should create regional competitions like they do on the homebrewers side of their business – let the best of the best make it to the final competition and festival. What we have now is a smorgasbord of great, mediocre and quite honestly some of the worst beer I’ve ever tasted (counting both commercial and home brewed concoction). People that work with the BA contend it would simply be too difficult to create regional competitions, but I suspect it has more to do with a general lack of will. After all the BA along with brewers guilds across the country are more focused on how much money they are raking in from of new dues to care about the consumer. I truly wonder where this will end? 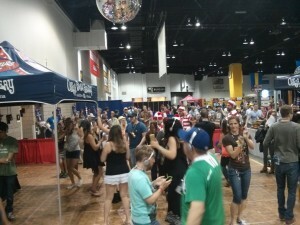 Will the GABF continue to expand every year moving forward to encompass another 1,000 booths? There are over 4,000 breweries in the US now and we are in uncharted record territory. Since 2011 the number of breweries doubled…will it double to 8,000+ in another five years? If the BA doesn’t want to create regional competitions that feed into the GABF making it more meaningful and manageable then I hope it considers at least vetting prospective breweries and their offerings, otherwise its future as a well respected world class event could be in jeopardy. Like many acquaintances that no longer go to GABF I too might decide targeted events like What the Funk and the Denver Rare Beer Tasting are more worthwhile. Perhaps all sessions of GABF will devolve into the scene normally encountered on Saturday nights as more discerning drinkers make way for a crowd of obnoxious drunks that care more about getting trashed than they do trying innovative or well made beer. At that point I think we can toll the bell, for GABF as we once knew it will truly die. This entry was posted in Beery Happenings Beyond, Blogroll. Bookmark the permalink.